Wonder why he had to run. Must have been a mechanical. Yes, a mechanical. He was leading the race ever since lap 2 or something, but then some mechanical happened (not sure what) and he lost out. City of Dreams, as a t-shirt that I own loudly declares. Not so much news as an editorial but I was very impressed with Sunday's new circuit at Spa-Francorchamps. If the previous day's race in the sands of Koksijde demonstrated the handling expertise of cyclo-cross' élite, then Francorchamps gave us a display of stamina for what must have been one of the most physically taxing races of the season. Shouldering their bikes, the riders had to scale a horribly steep wall that reminded one of the sandpit in Zonhoven except that the stony ground underfoot here was treacherous and without ropes for support. Elsewhere and in drier weather one might have expected a lot more riding rather than running but this corner of Wallonie gets plenty of rain and the peaty forest soils make for tough conditions. Erwin Vervecken's course design thus required some difficult decisions about if and when to dismount. However, I reserve the expression of my warmest sentiments for the uphill finish on the motor racing circuit. A ridiculously hard climb on a laden 'cross bike, it would have given us a marvellous sprint duel had Pauwels and Van der Haar made it there together but in any case it took its toll on everyone as individuals, lap after lap, and really elucidated the gaps in strength between the toppers. This was a CX race which delivered much of interest for road fans. Indeed, as they crossed the line at the end of the hour, a survey of the scene had more in common with the more severe mountain top finishes of a Grand Tour, with riders fighting for breath and wobbling with support from their soigneurs. I'm talking to myself on here and I like it very much. Well now, this is articulate, funny and real writing from a mainstay of the CX scene and proves that years of living among the crude peasants of smalltown Flanders does nothing to diminish a sympathetic sensibility. Speaking as another example of that very same phenomenon, of course. But I digress, as Fusske knows I am wont to do. Too often the rider's perspective is so dumbed down as to be completely colourless but Wyman's zest for the small details renders her worthy of some greater published tract in the future and probably a better spokesperson for women's cycling than most of her other, goal-bleached contemporaries. Lucid cycling journalism is nearly a desert now that even Barry Ryan has finally succumbed to the madness of literary mirages. The unselfconscious enthusiasm of Helen Wyman is a much-needed waypoint wadi on the long trail to the caravanserai of Shane Stokes. It is a little known (and little demanded) Larrifact that I used to live in Milton Keynes City of Dreams. Hideous place with absolutely no redeeming features, I can only hope that this weekend's World Cup CX event will deliver one good reason why all that naïve urban planning and its attendant hokey esoterica was worthwhile in generating a Rorschach nightmare blot on the map. All across Flanders it has been a foggy sort of day, obfuscating the daylight, and these conditions gave the superfast Bpost Bank Trofee race at Hamme a nice, dramatic complexion. Flag in the ground, this could be the race on which people will look back and say there was a generation shift. The likes of Van Aert, Adams J and Van Der Poel M have been entertaining us for a few months already but they took advantage of the harder ground and the higher speeds to demonstrate teamwork, tactics and athleticism. Indeed, for much of the hour, they were the ones giving lessons to their seniors. With the conditions totally different to yesterday's muddy run at Milton Keynes, Hamme was a parcours in which one needed teammates. It was the nearest I have seen CX ever come to Six Day racing! The pairings of Adams - Van Aert and Walsleben - Van Der Poel worked well. Even Nys benefitted on several occasions from the unusual presence of his wingman Vantourenhout S at the head of affairs. Ironically, the least effective partnership today was the classic pairing of Pauwels - Vantornout. If yesterday's winner went fast out of the blocks and then rode a tactical three quarters, the latter never seemed to get on terms with the race. But the story of the day was rightly place aux jeunes with a thrilling finish going down to the wire. After several penetrating solo moves, the bell ringing one lap too early and an unfortunate late fall from Meeusen, a large bunch looked like sprinting it out but Walsleben's late versnelling forced Adams and Van Aert to chase and gave Van Der Poel a springboard for the win. Except that the dauphin didn't win, mistiming his final effort and finding himself outsprinted in the final metres by a coolly resurgent Van Aert, who had looked finished after a traffic jam on the last corner. Walsleben hung on for a creditable third. Meanwhile Nys, who had also rode tactically on a course that didn't suit him, sprinted well to sneak in for fourth and consolidate his lead in the BPost Bank Trofee, in which he has still to win a single round himself. Pauwels was fifth. Lovely day's racing and one has to credit the hungry youngsters for distrupting the racing patterns we have become rather too accustomed to seeing in top flight Euro CX. You think so? I thought it was pretty boring. Last lap or two were decent, before that nothing worthwhile happened. The whole parcours was too straightforward, it lacked spice. Decent race because of those last two laps between the youngsters, but no more than decent. Today is the Druivencross. If you're watching it on TV, look out for me beside the course! I'll post pics later if there are any decent ones. After the junior and women's races it became clear that this race would be difficult. And muddy! In the final throes of the race, Van der Poel opened hostilities, and dangled ahead of the group for a lap and a half. He was never out of sight, however, and after a surge from Meeusen was recaptured and went to the back of the group. Vantornout then took over the pacesetting, and the group was kept roughly together until the last few hundred metres, when the two Belgians pulled ahead of Van der Poel and Walsleben in the sprint. Vantornout's sprint was admirable in itself, but he could never keep up with the much faster Meeusen, who powered home for the victory. Third was Van der Poel, and Walsleben came home in fourth, over a minute ahead of Van Kessel, the next rider to finish. It's a very good one! Thanks Fus! You're too kind. Happy for Meeusen. He had a tough couple of years, but seems to have finally made the jump to the top this time. And it continues to be a year of a lot of different riders winning - there is no single dominant force at the moment, which is great after years of Nys. And more good news: Behind the rise of Lars van der Haar and Mathieu van der Poel, Corné van Kessel is becoming more and more prominent as well. He's had a few good results in recent weeks, with a 5th place now. Good times to come for Dutch cyclocross! Yeah, I'm glad for both the mentioned Fideas. Meeusen now has two big wins, here and Ruddervoorde, and I'm almost sure Van Kessel is third in the World Cup! All I can say, since you've done your report already and you don't need another, is that it was waaaaayyy harder than it looked on TV. Who spotted me in the crowd, then? Anyone? I was clearly visible a few times. Looking at those pictures, the biggest differences between a World Cup cross and a cross race are the number of spectators and - more importantly - the level of the competition. As I was walking by what is normally the stage door entrance to the local theatre in Overijse yesterday, I saw Pauline Ferrand-Prévot sitting in the doping control. She looked thoroughly fed up. That wasalready probably a good half hour after her race had ended, just as it was getting dark. The room was full of yokels and she looked a bit lost there sitting mournfully behind her second place bouquet. That said, having seen the highlights, if Pauline keeps riding this season (this was only her third CX race iirc) she is likely to take down the hitherto dominant Cant sooner rather than later, having only lost out in the last lap or so yesterday. "I feel good on the bike," Nys says. "It's just that my results in races haven't been so good." "What bothers me most is that the criticism goes too far. To claim from one day to the next that I'm now too old, I think that's going too far. Maybe that's the reason why I don't feel good right now. "I don't feel ill and my blood test results prove that I'm not. ... I can't pinpoint a single cause. There's a bit of everything, I guess. In Overijse, I felt empty very quickly and I didn't feel like fighting through it. "But the criticism I'm getting is too much. At the Koppenbergcross I rode as well as ever. But afterwards I heard people saying I'm too old. That bothers me, especially because those comments often come from people who were praising me to the heavens only a month earlier, saying that I'd dominate everything until I was fifty. "As soon as I get through this, I'll probably look back on it as a very instructive period. It's not the first time that I've hit a trough like this. I'm only human and not a robot. Maybe in the past I gave the impression that everything always went smoothly. But that's not the case. "I'm fine with people expressing their frustration at how successful I've been in my career. But those people have no right to stop me enjoying my sport. I want to stop in a decent way. "These young riders aren't a problem for me. They keep me focused and motivated. I have no trouble with that. At the age of 38, you have to let go of certain things. Those who can't will become old and frustrated riders. And that's the last thing I want to be." For some reason I'm getting the feeling that this one is crap, but anyhow, here's my review of Zilvermeercross. Today, at an unusual night race, no one could beat Wout Van Aert over the natural sand of Lake Zilver. The young Belgian was at the forefront of the race from the start, following Van der Poel's attack right at the beginning of the race, and never out of the top 4 after that. As mentioned, Van der Poel attacked out of the gate, forcing a selection, consisting originally of himself, Van Aert, Meeusen, Sweeck and Walsleben. These five would stay together for the majority of the race. Van der Poel then had a big attack, during the commercial break, arising the ire of fans watching, but he was soon pegged back by a Meeusen - Van Aert combination. Sweeck then attacked, and dangled ahead of the group for two laps, but was caught when Tom Meeusen, Lord of the Bunnyhops, (TM) hopped over a 50cm concrete barrier, and caught him up. That is when the drama happened! Originally believed to be a crash, Mathieu says: "I got stuck in the sand, my shifter got stuck behind the fence. I held up the others." Sweeck was away, the group was fragmented, with Meeusen worst affected. Not so Van Aert. He was not badly affected by the Dutchman's mistake, quickly caught up to Sweeck, and - what can only be described as - zoomed past him with just under 2 laps left. He extended his advantage all the way to the line. "I felt really bad in the beginning, I even wanted to work for Rob." he says, but still, he managed to win. "I found myself in a position where I could win the race. No idea what happened behind me. I was chasing Sweeck and suddenly I was all alone." 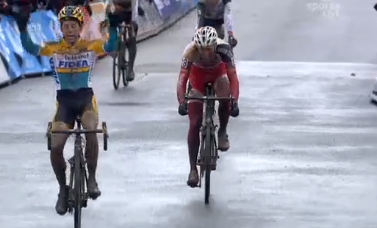 Zilvermeer is the 20-year-old's fourth win of the season, after Koppenbergcross, Koksijde and Hamme-Zogge. In the women's race, Sabrina Stultiens prevailed from a close battle with Ellen Van Loy and Sanne Cant, ending the Belgian champions recent winning run. The Dutchwoman has had a decent season so far, notably finishing second in Koksijde. Tom Meeusen, Lord of the Bunnyhops™. I'm quoting this for one of the minor sponsors on Wout's jersey. Everybody who's ever been roadside at a race in Belgium will know them ... and their jingle. It's a (Swiss) watch manufacturer. Sponsoring virtually every Flemish race since time immemorial, and running the car that drives ahead of the race. Essen tomorrow, hometown of Styby. It is rather like that old BBC series Tripods, which scared the hell out of me as a kid and riffed on the idea of HG Wells' alien invasion having been a success. You could hear them coming from far away but you could only guess at what the outcome might be. Given the unique topography of this fine country, in amongst which one can often hear things over long distances, the Rodania jingle has become part of the excitement of waiting for a Belgian race, but in truth it is really a sort of infectious irritant. Everyone thrills to hear it only for its significance as herald of the great spectacle, even while the jingle itself is ridiculous. A couple of years ago on a bitterly cold afternoon at Omloop Het Nieuwsblad, the Rodania car could be heard from afar and when at last it arrived on the Molenberg where I was standing, it promptly bottomed out on the worst of the cobbles. I can tell you that, as it scraped painfully along, desperately trying to free itself from the savage stones before the race traffic arrived, everyone laughed heartily and a shaft of sunlight broke through the thick clouds to let us know that, if there was a God, He was at rest that day and, surveying His creation, He saw that it was good. Today wasn't the muddiest Namur has ever been. However, the races produced by the dry circuit rivalled any before. Kevin Pauwels took victory on the Walloon course, extending his World Cup lead, and equalling Van Aert in win count. In the Elite men, the race started with two slightly lesser known riders coming to the front, the Swiss Marcel Wildhaber (Scott) and Sascha Weber, (Veranclassic). These two held the lead for almost three laps when Meeusen decided it was time to make a move. This fragmented the group, leaving just Van der Haar, Pauwels and Van Kessel. He had eight seconds when Lars Van der Haar came after him with a blistering attack. He soon caught him, and it looked like the two were going to build a handsome lead when Pauwels made his move on the hill. The three came together at the start of lap 5, and Pauwels immediately tried his luck, to no avail. The trio stayed together, for the most part, until Van der Haar and Pauwels went into the pits at the end of the lap, and Meeusen immediately gave an all-out attack. A panicked shot in the dark? One has to think so, as he fell way back immediately afterwards. He would come in fourth, 1'24" behind. Right then, Van Kessel came up to the Pauwels group. Van der Haar saw Meeusen falling back, and tried an attack himself. He disappeared like a bullet from a gun, and got a huge gap. McCrossan was left shouting, and I was thinking of a catchy headline mentioning Lars or Jack Russells. Van Kessel took up the chase of his compatriot for the majority of the lap. However, almost directly after Pauwels went in front of him, he slipped off his bike under the trees! This left Pauwels on his own, and Walsleben, who previously had gone almost unnoticed, in third. After the crash, Pauwels began the chase in earnest. It took him over a lap, but finally he bridged the gap. With two laps remaining, they crossed the line together. There was a little bickering over who would do the work, and because of this, Walsleben was catching up. He was 14 seconds down. The duo stayed together for the second lap. On the laatste ronde, Pauwels looked close to cracking the Dutchman on the early hill, but it was on the off-camber section where the damage was done. Fatigue seemed to affect Van der Haar, who made a few mistakes. However, Pauwels was totally flawless, ekeing out a larger and larger gap. He kept this gap for the rest of the lap, and took victory by ten seconds. Walsleben chased all the way, and came in third, nineteen seconds down, and finished over a minute ahead of Meeusen, who must have really cracked over the final few laps. Van Kessel was fifth, and in a great result for the Swiss, Marcel Wildhaber came home in sixth. "I had a small gap before the off-camber and I rode it well," the victor says, while Van der Haar is disappointed, saying "I wanted to ride the off-camber first, but I couldn't see anything, and I lost the race there." Pauwels now leads the world cup with three hundred points to Meeusen's 223. In the women's race, world champion Marianne Vos, on her first day back at the office, jetted away from the field on the very first hill. She led for a few laps, and it looked like she would nitch her first win only forty minutes after throwing her leg over a cyclo-cross bike for the first time in ten months. However, she was gradually being reeled in by Katerina Nash. Nash continued to increase her advantage, thanks to Vos' very poor penultimate lap. She crossed the line first, in her first World Cup victory since 2011. Compton came in third, over a minute down. As far as the World Cup goes, Sanne Cant still leads, but has had her advantage cut to single point over Compton.